As you leave Oaxaca for the drive towards Mitla along Highway 190, fill up with gas, since there are lengthy stretches of highway without stations after you turn off and head towards the coast. You'll approach that first interchange after close to a half hour of proceeding along straight, essentially flat highway. Take the 190 cut-off to Tehuantepec / Matatlán. After about five kilometers of rolling hills, you'll reach the "world capital of mezcal," Matatlán, with production facilities and shops peppering the roadsides for about three kilometers. The billowing smoke is from deep pits being readied for baking agave, and to a lesser extent the stills fueled with firewood. For the next hour and a half you'll be climbing, at times considerable inclines, then descending into fertile river valleys, along curvy, well-paved yet at times repaired highway. If you hadn't filled up for gas earlier, do so just beyond the first military checkpoint, an hour into the drive, at San Pedro Totalapan. The predominant vegetation is agave under cultivation --- occasionally on the steepest of hillsides --- and mixed brush, with pole cactus and palm interspersed. Towns are encountered, with small stores, restaurants, pharmacies, mechanic shops, and even a guest house at about the two hour mark, in San José de Gracia. In the area around El Camarón you'll once again encounter a few fábricas de mezcal. Your final descent towards the coast begins at about three hours into the drive, when you'll finally find yourself speeding along straight-aways. Once you reach Marilú, you'll feel you're in the tropics, with signs offering fresh fish (mojarra) and cold coconut milk. You'll then have the option of heading up the coast to Huatulco, or down towards Salina Cruz, Juchitán and Tehuantepec. The new toll road to Chiapas, along Highway 200, has an interchange which can potentially create a bit of confusion. At kilometer 240 of the trip, more or less, you'll encounter a traffic circle with signs which do not assist in terms of reaching your destination. Take the exit which includes the words María Romero, and then ask to ensure that you have the right highway. Traffic and pedestrian activity, at least as of early 2009, are sparse. You'll be heading towards La Ventosa, so when you see a sign so directing you, you'll know you're on the right road. At about four hours into your trip, near kilometer 270 of your day's drive, you'll pass through the La Ventosa toll booth, with clean washrooms and a gas station close by. From this point, until your arrival at Tuxtla, you're home free. For the next 60 kilometers you'll be driving across flat winding plains. There's a stretch of 15 kilometers with two sets of large white windmills, very unusual and impressive to the eye, the second set with power generating equipment apparent. There are thereafter a couple of provisional checkpoints along sections of new, and then old and badly pot-holed road in the process of being repaved. Your arrival at San Pedro Tapanatepec follows along good highway traversing mango orchards, with a bit of ranching. In town you'll find a gas station, Banamex, etc. After passing through the next military checkpoint, once again you'll begin your climb into the mountains, arriving in Chiapas approximately six hours into the drive. The approach to Tuxtla is uneventful, marked by continuing periods of ascent and descent, stretches of plains, and traveling through a couple of small cities. Upon arriving you'll encounter a traffic circle, easy enough to navigate. You are not required to enter the city, but rather, will be traversing a number of overpasses in the course of about 20 minutes. You'll be passing high above and to the left of the city, then descending towards the fork in the road leading you to Chiapa de Corzo. Note that the cut - off is not well marked, so when you see the choice to veering to the right or left, turn off to the right. The two main attractions which you may find at Tuxtla and / or Chiapa de Corzo are the zoo and the Cañon del Sumidero. Both are easily accessible via Chiapa de Corzo, but could require a bit of backtracking. The advantage of staying in Chiapa de Corzo is that it's quaint, you do not have to enter the metropolis of Tuxtla de Gutiérrez, and it makes for an easy morning beginning for a boat tour of the canyons. However, if you wish to take the boat trip as opposed to driving through the national park, you may have to wait an hour or two in the morning until there are sufficient tourists to fill up one of the many waiting vessels. It all depends on the time of year in terms of level of tourism. We arrived at the docks shortly after the 8 am opening, only to be told that we'd likely have to wait at least an hour. We therefore hopped back in the car and drove to the lookouts in the Parque Nacional Cañon del Sumidero. The site, via boat or drive, should not be missed. The highway from Tuxtla to San Cristóbal de las Casa is perhaps the best quality stretch of roadway and most pleasant to navigate on the whole trip. Unfortunately the drive takes only about 35 minutes. It begins immediately after you pass through the toll booth as you leave Chiapa de Corzo. Almost all of the drive is ascent with easy curves. You'll descend to San Cristóbal over the final five minutes of the brief ride. "Must" visits while in the area of San Cristóbal, preferably with a guide notwithstanding that you'll have your own vehicle, include Chamula and Zinacantán. Although along the basically good, two-lane highways descending from San Cristóbal to Palenque there are several homes and businesses offering gasoline for sale, and at Ocosingo you'll find gas stations, it's best to fill up as you leave San Cristóbal. Don't worry about your departure time, since with stops en route you'll probably be too late to take the tour of the ruin, and in any event it's best to visit the site during the early morning hours before the afternoon sun and heat preclude enjoying your visit to the maximum. Without stops, the trip takes about 4.5 hours, over the course of about 200 kilometers. About 11 kilometers into the drive you'll find a cut-off to the left, onto highway 186 to Ocosingo. Take it, even though there is no sign for Palenque or Agua Azul. Notwithstanding several ascents, you'll gradually descend into the hot jungle environment characterizing Palenque, a stark contrast to the relatively cold climate of San Cristóbal you've just left. You'll pass through pine forests and lumber mills, ranches, quaint roadside eateries, and stalls offering local produce for sale. At about 65 kilometers into the day's drive, a "don´t miss" stop is at one of the two or three amber outlets, in an area where the mineral is mined and then worked into predominantly silver accented jewelery. If you're in the market for amber, wait until your arrival here. You will have likely visited the Amber Museum in San Cristóbal, so by the time you've reached these workshops you will have learned how to detect the real thing from the glass and plastic imitations. These stalls boast true amber, and for the asking you'll be shown pieces in the rough, how to identify the fakes, and how raw amber is fashioned into fine jewelery. On the approach to Ocosingo you'll have an opportunity to also stop at craft and coffee outlets. In the course of the decent you'll encounter cultivated bromiliads used as impressive garden borders, and produce changing to tropical varietals such as bananas, coconut palms, sugar cane, and perhaps surprisingly, still some corn. Almost immediately you'll then begin to encounter more switchbacks and peaks and valleys, with once again a net descent into a lush, green forest environment with streams, waterfalls and even a water park and an ecotourism site. After the military checkpoint just over 100 kilometers into the drive, your descent will be characterized by predominantly straight-aways for close to 40 kilometers as you arrive at the cut - off to the left, for Agua Azul, another "must" on your trip. Don't be surprised to find that you have to pay two separate tolls or entrance fees. In the parking area, you'll be asked by a youngster if he / she can guard your car. We declined. Later we found that our car aerial had gone missing. Give the kid 10 or 20 pesos, both here and at Palenque. The ride from Agua Azul to Palenque takes about two hours. 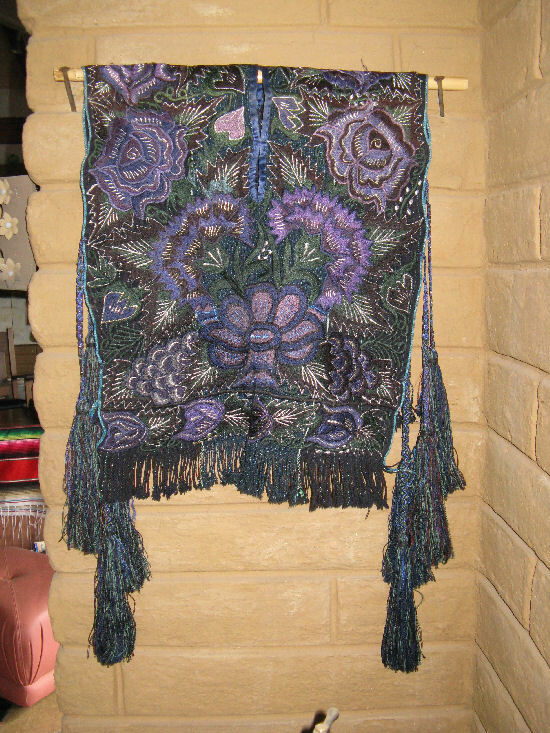 A few kilometers into the drive you'll pass through a stretch of stalls on both sides of the highway, selling hand embroidered skirts, blouses, dresses and shirts. From here on, until Palenque, the highway descends, with easy curves and lengthy straight-aways, featuring corn, sugar cane and plantain. Get an early start to your day at the ruin. The gates to the park open at 7:30 am, with tickets to the site available for purchase at 8 am. You can secure a guide while waiting to buy tickets. Suggest that you wait for a group of about eight people to make the cost more reasonable. You'll be given a per person rate on the basis of eight or ten in the group. In our case, the guide decided to take us for his per person rate for eight, with only six of us, presumably anticipating that it would take a fair bit of time to get the other two, and preferring to finish the tour before the hottest time of the day … or perhaps anticipating being able to fit in another tour if he finished with us early enough. If you intend to spend the night in Córdoba or Orizaba, you might want to consider leaving Palenque early the following morning because of the driving time involved. Of course if you intend to head to the city of Veracruz, another plan might be in order. Between Palenque and Orizaba you'll encounter at least three cut - offs leading to Veracruz, and at one point you'll only be about 50 kilometers away from the city. Leaving Palenque along route 186 you'll immediately encounter palm and sugar cane under cultivation as well as cattle, on both sides of a good, two lane highway with flat curves and straight-aways. After about 25 kilometers, immediately after passing through your first checkpoint you'll turn left. During 2009, the highway was being converted from one lane in each direction, to a lane and a half, quite common throughout southern Mexico. As noted earlier, this wide shoulder is perfectly legal to drive on, and in fact speeds up traffic flow as long as drivers are prepared to yield to the right. Aside from this construction, the highways for the rest of the trip back to Oaxaca, or to Puebla, are excellent. Within an hour or so the highway will be solid four lane, minimum. It will be basically toll road for the rest of the journey. About 125 kilometers into the day's trip you'll have the option of staying at an impressive Hilton Hotel & Conference Center, easily visible from the highway. Just before that complex you'll see a large underpass where there's a gas station. About 25 kilometers further, as you enter Villahermosa, take the Cárdenas cut off and proceed along highway 180. You'll be continuing along a highway with plantations of bananas, coconuts and sugar cane, and fields of familiar tropical flowers. Consider a brief stop at La Venta, a small town known for its Olmec ruin. But the site closes at 4 pm, so keep that in mind if interested in a visit to the site. After about a half hour, roadway curves will once again begin, and less crops will be apparent, now with more herds grazing. You'll pass through river plains and over a large suspension bridge. Based upon the recommendation of at least one tour book, we had planned to spend the night in Acayucan, Veracruz, but as noted earlier felt compelled to continue on to Orizaba, after dark (see Addendum). The saving grace, at least in our minds, was somewhat of a comfort in passing through four toll booths over the next 2.5 hours, between Acayucan and our ultimate stop for the night, Orizaba. The cut - offs are clearly marked and leave little room for error. From Acayucan, just continue along the highways marked for one or more of Puebla, Mexico City, Oaxaca, since it's well after Orizaba that you'll actually be turning off for Oaxaca. For those interested in floriculture, plants, cactus and succulents, consider a stopover at Fortín de Las Flores, perhaps as a taking - off point for a diversion to Veracruz. Córdoba is a reasonable option for spending the night, close to Fortín de Las Flores, and with many more hotel options as well as daytime sights. But Orizaba also has a number of interesting options worthy of consideration for a stopover, and a visit to its tourist office makes for a good start for a short, pleasant visit to the city before continuing on to Oaxaca. The drive from Orizaba to the Oaxaca / Puebla interchange is extremely scenic, climbing dramatically for all but the final few minutes. 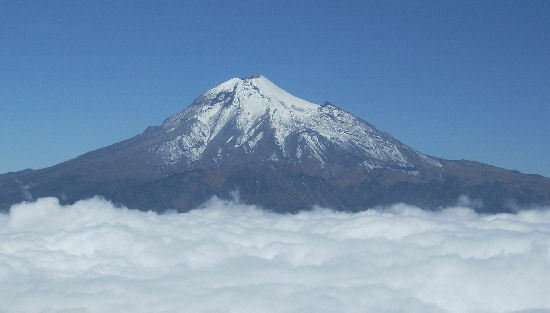 The snow-capped peak of Orizaba is particularly impressive. You'll pass by areas of large, ornamental agave, used as property boundary lines. Simply follow the signs indicating Puebla / Mexico for about 30 - 40 minutes, until you finally see the Oaxaca cut - off, at which point you'll either carry on to Puebla, or return to Oaxaca. The home stretch of your journey should take about 2 ½ hours, without stops other than to rest and gas up. However, there are couple of worthwhile sights to consider. Unless you want to spend time in Tehuacan, your first stop will be at the onyx / marble village of San Antonio Texcala. Take the second Tehuacan exit (after the Tehuacan toll booth), onto highway 125 leading to Huajuapan. After 6 km you'll arrive at the village, with several factory outlets where you can by almost anything into which onyx and marbel can be shaped --- tequila sets, plates, sinks, lamps, tables, bowls, boxes, unicorns, fish, hash pipes, and of course a number of diverse ornaments with religious imagery. Prices are about half of what you'll pay elsewhere. Next is the Museo de Agua, or water museum, actually a misnomer because it is so much more. Take the well-marked next exit after your return to the toll road, for Sangabriel and Chilac. There will also be signage for the museum. You'll be given a tour (in Spanish) in the main building, and of the outside surrounding landscapes. You'll learn how progress is being made to teach villagers in desolate regions where water is scarce and soil fertility is lacking, to conserve and recycle water; to use compost, worm culture and other techniques to enrich the land; and to grow and market nutritious produce such as amaranth. In terms of the land use and sights, near Tehuacan you'll see long narrow white-topped buildings where poultry is produced and then trucked throughout the state of Puebla and other nearby states. There will be a couple of lookouts demarcated as stops for tourists to pull over and appreciate and photograph the deep valleys and high mountaintops. Long, well-marked expansion bridges showcase the valleys and mountains. You'll pass over a geological fault. There will be several kilometers of impressive pole cactus. Close to the approach to Oaxaca you'll see vendors on each side of the highway selling brightly colored miniature wooden trucks. The last of several toll booths is Huitzo. About 15 - 20 minutes later you'll approach Oaxaca. A few minutes after entering the city, you'll be given two opportunities to turn to the left (one of the signs is difficult to interpret), but unless you've been provided with specific instructions to get to your hotel or B & B, and know it's in a northern suburb, best is to just keep driving straight, eventually entering onto a one-way street which will lead you to the core of the downtown area and the zócalo. We had planned to spend our last night in Acayucan, Veracruz, having noted three hotels, one of which piqued our interest because it appeared to be the only middle-of-the-road and acceptable option, at least for us. Immediately upon entering the town, at about 6:30 pm, we were pulled over by two state troopers, and asked to produce some type of sticker about which we knew nothing. I produced license and ownership without a request to do so. The more belligerent of the officers, Taurino Santiago Ramas (Santiago) insisted he would phone for a tow truck, and did pull out his cellular and make a call. After ten minutes of heated banter, I told me wife to just ask him "how much?" Santiago said he didn't want money. This was a shock, since my initial assumption was that it would just be a matter of how long, and how much. He became more testy, almost as much as we had become. Out of the blue, Santiago's mood suddenly changed. He asked us about our plans for the night. We indicated that we intended to stay in town. He immediately mentioned his hotel recommendation and how to get there. It was the same hotel at which we had planned to stay. We assured him we would indeed lodge there, whereupon he told us that we would have to pay a 1,000 peso fine the next day. In the same breath, in a softer tone, he proposed "but since I'm a nice guy, and have a kind heart, if you like, instead you can pay something to me." I pulled three fifties and a twenty peso bill from my pocket, and offered him one hundred pesos. Santiago demanded, "I'll take them all." So 170 pesos lighter we got back in the car, hearing Santiago's loud laughs, directed at his partner, us, and anyone else on the crowded street within earshot. But I think we got the last laugh. Santiago certainly assumed that we were going to stay at his suggested hotel, and in fact we drove off in that direction with he and his sidekick watching. He had probably called not for a tow truck, but the hotel, and advised that we'd be coming by, and confirmed the amount of his commission for the referral. Otherwise, he probably would have demanded a bigger bribe. Of course we did not want to stay anywhere he suggested. We were concerned that overnight our belongings might be snatched from the car. We decided it would not be prudent to stay in Acayucan at all, so we high-tailed it out of Dodge, and drove a further 2 ½ hours, during the night, until bedding down in the city of Orizaba. Alvin Starkman received his Masters in Social Anthropology in 1978. After teaching for a few years he attended Osgoode Hall Law School, thereafter embarking upon a successful career as a litigator until 2004. Alvin, a good-standing member of the Law Society of Upper Canada, now resides with his wife Arlene in Oaxaca, Mexico, where he writes, leads small group tours to the villages, markets, ruins and other sights, is a consultant to documentary film companies, and operates Casa Machaya Oaxaca Bed & Breakfast, providing the comfort and service of lodging in a Oaxaca hotel, with the personal touch of a small country inn.